Published: Nov. 12, 2012 at 07:53 a.m. Updated: Nov. 12, 2012 at 09:52 p.m. 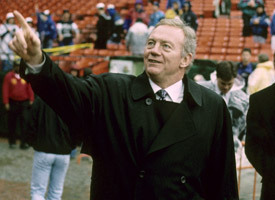 Even in a victory, Dallas Cowboys owner Jerry Jones doesn't mind courting a little controversy. At least the team's locker room was open this week. Check out the best images as selected by NFL.com editors. Told of the reported interest from Cleveland Browns president Mike Holmgren in possibly coaching the Cowboys, Jones didn't exactly throw water on the rumors. "Of course, Mike Holmgren is a heck of a coach," Jones told KRLD-FM, via the Dallas Morning News. "But the facts are that Jason Garrett gives us an outstanding chance to be what we want to be. So, there you have it. I wouldn't comment one way or the other there with Mike." "I was interested in why (Holmgren) said he would like to be the coach and that was good," Jones said. "We are good friends, have a lot of respect for each other, served on the competition committee together for eight years. He's very familiar with how we operate the Cowboys and does have a high appreciation for our talent that we have on the team right now. All of that is a compliment. Thank you, Mike." We wouldn't take the comments too seriously. The entire story is fueled by two men who are happy to be in the news, even if they don't plan on acting on this apparent media flirtation. The stakes haven't changed in Dallas. The Cowboys are 4-5 after nine games. They are only one game behind the Giants in the loss column. Garrett might need a playoff berth to save his job, but there is plenty of time to make that happen.